Fractal is just outright amazing with any creatures that produce quanta. If your opponent doesn't have a mass damage spell on hand, it's like drawing six or so pillars at once over only two cards, and additional fractals only compound the matter. It also combos far too well with Hope and Feral Bond. I had a deck that shows how this can work out to be pretty nasty but I accidentally posted it in Hope's topic, don't want to post it again in case it gets moved here. I just made this deck and it seems really overpowered (might need a little tweaking to be optimal of course). --Get a measly 11 aether quanta--this is the ONLY true quantum requirement the entire deck has, the rest of the fractals and quints are more of a "just in case"
Quint a Leaf Dragon, Fractal a RoL and save at least one in your hand in case of mass damage, play Hope in two turns. Yeah there's things that can go wrong with mass damage, but I've managed to set it up in four turns before and it's basically invincibility + infinite life quanta as long as you get more fractals than they get mass damage spells. Thunderbolt would take care of some Blue Nymph and Alfatoxin problems. 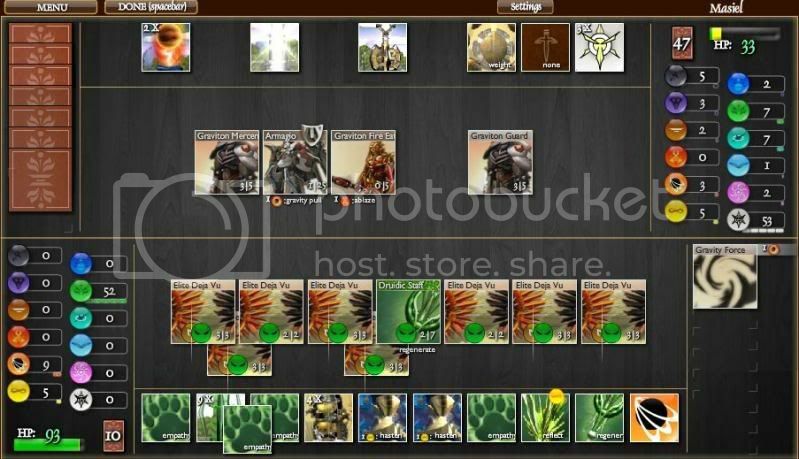 It's kinda like unupped FFQ except you can make the leaf dragon immortal and use Fractal to save on heavy hitter cards. You really don't need the nymphs but they make it more fun when you can play six of them at once. 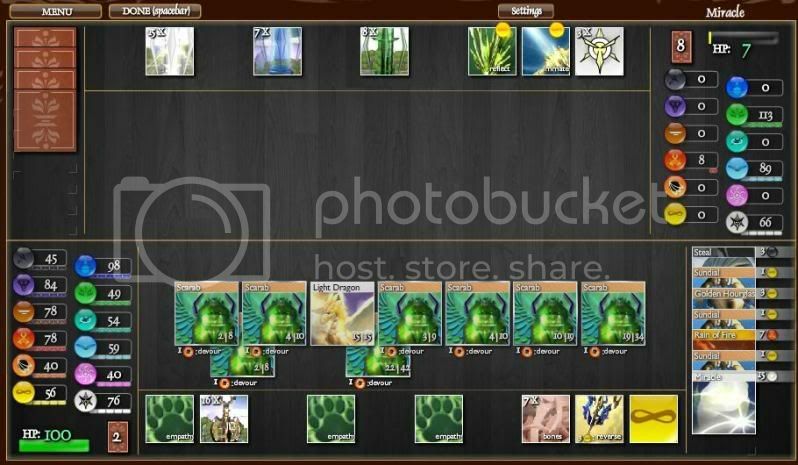 I managed to have 8 Jade Dragons in play on turn eight or something a couple times, other times I'd fractal a Green Nymph and play them all at once with the massive quanta pool. That's 30 cards for the last four items, plus an implied 92 earth quanta, and we'll say you only need to kill 100 HP in one shot which means it only takes 134 fire quanta. You'd need a way to pay for miracles as well, and those SoGs have a small cost too. I'd say you decked out a few turns ago. I'd also say you're cheating since you're holding 6 lances and 6 miracles in a 7 card hand. edit: returning to the card discuss, have you tried it with aflatoxin you and your oponent and then explode it? with bonewall/boneyard/Condor? Yeah, this is currently the only multi-target spell/ability in the entire game that affects your own creatures. It's pretty useless as creature control against anything but cells though. I meant it's way too cheap. 2 quanta of any element in any deck for renewable healing while the only other renewable healing in the game costs 5/4 life and requires you to play a deck with lots of creatures to be effective. The cost should be closer to 4 quanta if it's to be balanced. Similarly, Shard of Divinity is a little too cheap for a 20 HP heal for any element. I suppose there are those, but the amount of time quanta used in getting those cards in play is heavy. I've never been able to afford to play them before very late in the game if I had to play an Anubis first. Makes for a deck that's so slow to start it doesn't have much of a chance. The cost to effect ratio doesn't even resemble balanced. It's even worse than Shard of Divinity in this regard. Parallel Universe will cause the new scarab to receive an HP bonus equal to the number of scarabs already in play. Using this mechanic plus a Heavy Armor or two it's possible to make an army of scarabs with insane HP. Other than that it's pretty much an Otyugh that requires Heavy Armor to eat anything at all. It even requires gravity too. There's just no situation where you can afford to hoard these in your hand and play a bunch at once to use the HP bonus. Suffers greatly from the fact that time and aether have no buffs, offensive creature abilities (aside from scarabs which aren't great without being able to target them for PU) or growth creatures. There's really nothing worth making immortal between these two elements until you add a third element. Not to mention that multiples of this card end up as a waste of quanta/draws once you have one in play and the chance of drawing a single one at the right moment is slim. Also kills to have it in your opening hand. Gravity Pull is a permanent effect, not an active ability. Meaning, you could Gravity Pull with an Armagio, then petrify it, and the ability would continue working. Or you could play Gravity Pull/Force on a petrified creature at any point. Also, I don't believe Gravity Pull can be removed via Lobotomizer, only Eternity (could be wrong though). Hey guys, wonder if anyone remembers me... er, anyway. This deck is a lot like Scaredgirl's deck over in duo decks purely by coincidence--I made the deck before checking the forums to see what anyone else had done. The difference is it's capable of killing a bit faster and has some creature control but is a bit more luck-based being a tri-element deck and all. There are two versions of this deck, actually. The first is designed to be able to kill some level 5s as they just have too much HP for a pure blitz to work reliably. Second version of the deck is designed to just be faster to reduce the chances of spells/weapons being used against you. Gravity Force is your creature defense and also lets you kill Deja Vu hit with Antimatter. However, you will need to keep at least one creature with Adrenaline but not Momentum in order to be able to instantly kill your opponent's creatures with it--Momentum ignores Gravity Force. Your basic strategy is to kill your opponent quickly as Deja Vu die when the wind blows and if the wind comes with rain (of fire) you will likely not get back in the game. You can't fight Eternity/Eagle's Eye/Lobotomizer either because only Fire, Darkness and Aether can in any way at all (lol balance) and you can't deal with Earthquake because you're not Earth, though your total quantum use is still low enough that it's possible to survive it when it's from someone who plays by the 6 card 1 draw normal rules. You can barely survive Alfatoxin if you can manage to keep something offensive on the field, and this will mean a lot of healing for a little while with the Feral Bond deck version. There's a good amount of luck involved in getting those Deja Vu split before things go to hell. However, you can put out 24 shield-ignoring damage on turn two with a perfect draw and on turn three with one only slightly better than average. That's pretty nice. This deck could also be run as Life/Time/Aether with Mark of Aether, Quintessence, and Thunderbolt... except Deja Vu won't copy immortality from what I've seen. Unsure if that's a bug or not. Issue Archive / Cancelling Otyugh ability still drains mana/Otyugh cant reuse ability. I agree that there should be the option to cancel without penalty. Especially since it can currently cost you dearly through no fault of your own; back-row mutants require you to click them to see their ability (oops I just used my last two life for a 2 attack Dive so I can't mutate now). Also, the cancel button almost completely obscures one of your creatures where it currently appears.